Thank you for your interest in PVC PU Belted Curve and Bend Conveyors. We will be happy to discuss the pricing in more detail with you please fill in your details below and somebody will contcat you back with a quote. Alternatively please call us on 01772 690656 and please reference our part number - PVC and PU Belted Curve and Bend Conveyors. Belt curves with PVC belts are designed for smooth and consistent conveying of small, fragile and/or precious products. These conveyors allow a reliable transfer in close tolerance situations and some versions are also approved for conveying food products. 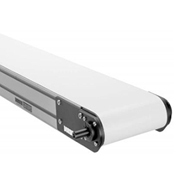 Small end rollers make these conveyors suitable for food, and conveying of small products.